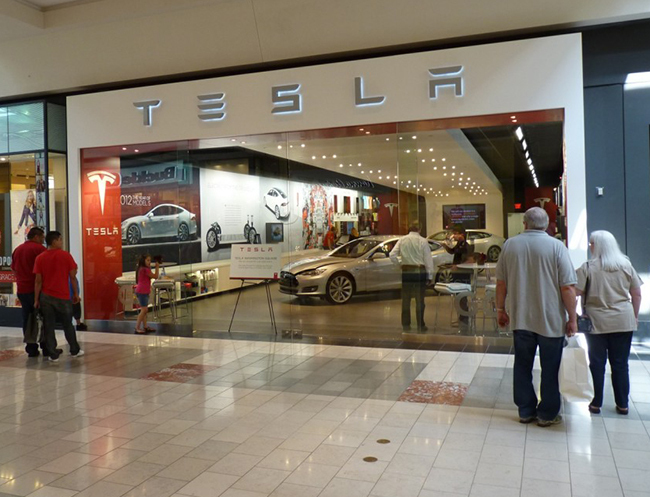 Tesla’s dealership gains are causing alarm among traditional auto dealers. Tesla made more gains in continued efforts to sell vehicles direct to consumers nationwide. New Jersey and New York both opened the door for the California automaker to operate stores in those states. These latest auto dealership gains are causing a growing number of traditional automakers and auto dealerships to speak out against Tesla. Seeing both states have made direct sales easier in favor of Tesla is not sitting well with some auto dealership advocacy groups. The National Automobile Dealers Association is combating the direct sales model, arguing franchised car dealerships better protect consumers and offer a great economic benefit to local communities. The NADA released a video through their official website highlighting how traditional dealerships help consumers. The video noted that these dealerships drive down prices, take the side of consumers with warranties and safety recalls and offer major tax revenue to communities through auto sales and creating high income jobs. The NADA argues many of these same protections and benefits would be erased if direct sellers gained a foothold in the auto dealership market. Some automakers are not sold on traditional auto dealerships offering the best sales solution. The Auto Alliance argues that traditional auto dealers wield too much power. They claim too many dealer groups push for strict franchise laws that benefit them at the expense of new car buyers and direct sellers. Opposition from the Auto Alliance could cause problems for franchised auto dealers in their future battles against direct sellers like Tesla. Automotive Trade Association Executives have already characterized opposition by the Auto Alliance against franchise auto dealerships as a disaster in the making for the entire industry.